The team at Star Physio has seen a lot of clients with jumper’s knee over the years. We shed some light on this overuse injury, common among volleyball and basketball players. 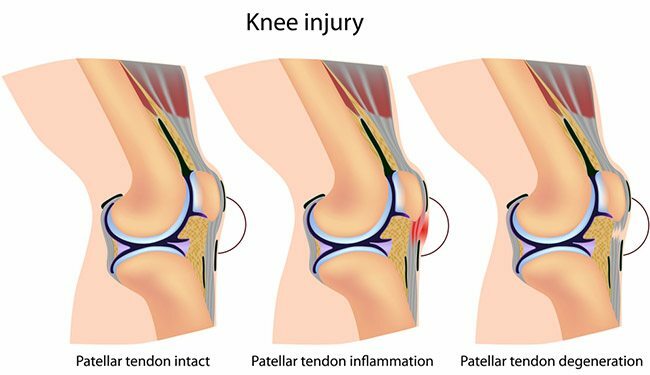 Patellar tendinopathy, commonly known as jumper’s knee, is an overuse injury caused by prolonged or suddenly increased stress of the patellar tendon on the knee. This particular type of injury is commonly seen in volleyball and basketball athletes because of the repetitive jumping and landing that occurs during training sessions and in matches. It is also frequent in running athletes due to repetitive impact. The pain associated with jumper’s knee is a result of tension and irritation of the tendon during overuse. Normally, the pain will occur during or immediately following a training session, but once it becomes irritated the tendon can continue to hurt throughout other low impact or non-impact activities. As volleyball athlete Tara West explains in her blog post on jumper’s knee, factors including training volume, sudden changes in training load or intensity, playing on hard surfaces, reduced lower limb strength and reduced flexibility are all thought to play a role in the development of jumper’s knee. How Can I Fix Jumper’s Knee? It’s crucial to seek help for any kind of tendon pain as soon as possible to avoid any further damage occurring. If left untreated, lesions can begin to appear at a rate that exceeds the rate of repair, leaving the tendon sore, damaged and dysfunctional. Having said that, rest is not recommended for this type of injury either. There are very specific physiotherapy methods that deal with this tricky condition so the best thing you can do to fix jumper’s knee is to get yourself to a physio who understands the condition well and is up to date with the latest treatment techniques. Pain-relieving techniques like ice and heat treatment may provide some additional relief as well. As our physiotherapist explains in his short video on the management of knee pain, we often identify muscles weaknesses or imbalances that need to be addressed through strengthening and conditioning exercises and also loosening up of the muscles in that area. And because rest and overuse are both off the table when dealing with jumper’s knee, your physio will almost definitely develop a tailored rehabilitation program to avoid degeneration and get you back on the field. For more tips on how to manage knee pain, visit our YouTube channel for more handy guides. If you think your knee pain could be a result of jumper’s knee, don’t hesitate to book an appointment at one of our three Perth clinics by calling us on 08 9481 1003 today.